Buffalo Chicken Wings with some little bit of an extra kick with Taco seasoning! No game day party is complete without some chicken wings! 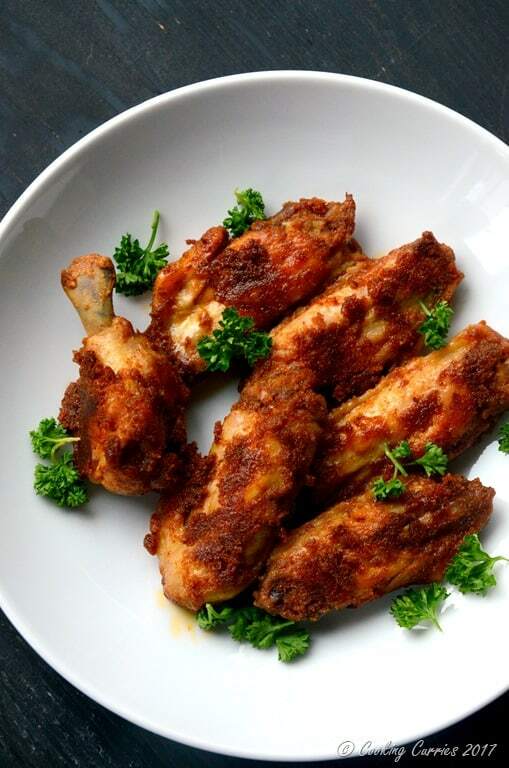 Every time we host a super bowl party, there has been chicken wings on the menu. 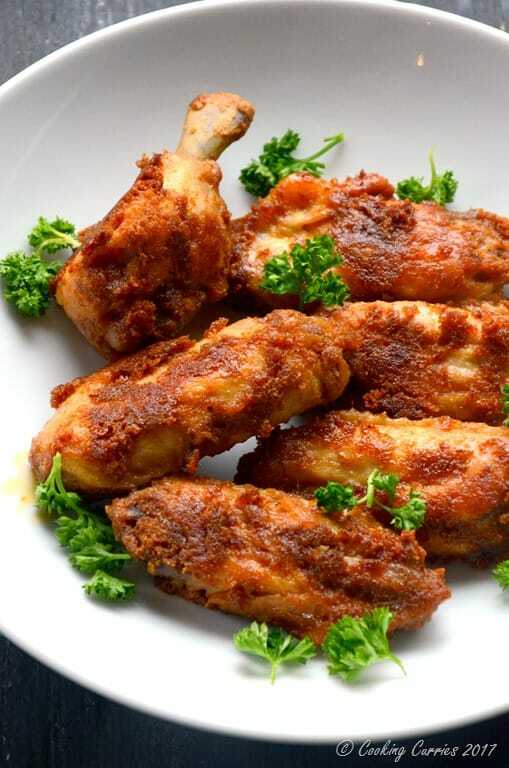 I am a vegetarian and personally don’t care if there is chicken wings or not, but when I host a party, I want everyone who is there to be more than delighted about the food spread that is there and being surrounded by a sizable number of omnivores (including the one I live with), whether to make chicken wings or not is never a question. Chicken wings, as popular as they are, are also super easy to make. 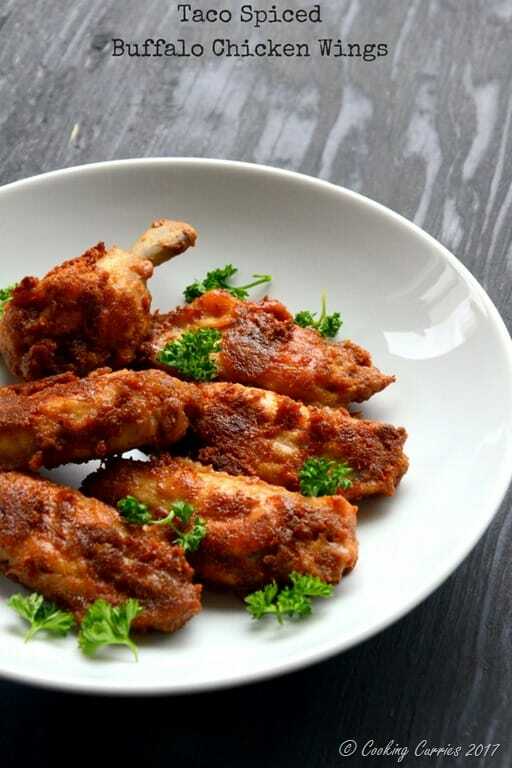 There are a few different ways of making them – boil or steam the wings with or without some flavorings and then bake them with the rest of the flavorings or more flavorings, bake them directly with the flavorings, marinate them or not marinate them and fry them. Whatever method you choose, it will be hard to go wrong with them. They are chicken wings after all. I used the boil them with some flavorings and then bake them with more flavorings method here. It took me about 40 mins from start to finish. Heat the water with the hot sauce, cayenne powder and salt and bring to a boil. In a medium bowl big enough to hold the wings, mix together the butter, taco seasoning, hot sauce, salt and garlic powder to a paste. Drain the wings and toss with the paste in the bowl. Line a baking sheet with parchment paper and line the coated chicken wings on it. Bake for 15-20 mins, turning the wings once halfway through, till both sides are crisped enough. Serve with some blue cheese dip or ranch dressing. Taco spiced chicken wings? That is GENIUS!! It combines my favorite flavor (taco spices) and my favorite food (chicken wings)! I’m so excited to make this! Thanks for sharing! You are very welcome, hon! These wings look awesome. I’m definitely going to give them a try. I have some chicken wings at home. I love all things taco! These wings sound awesome!